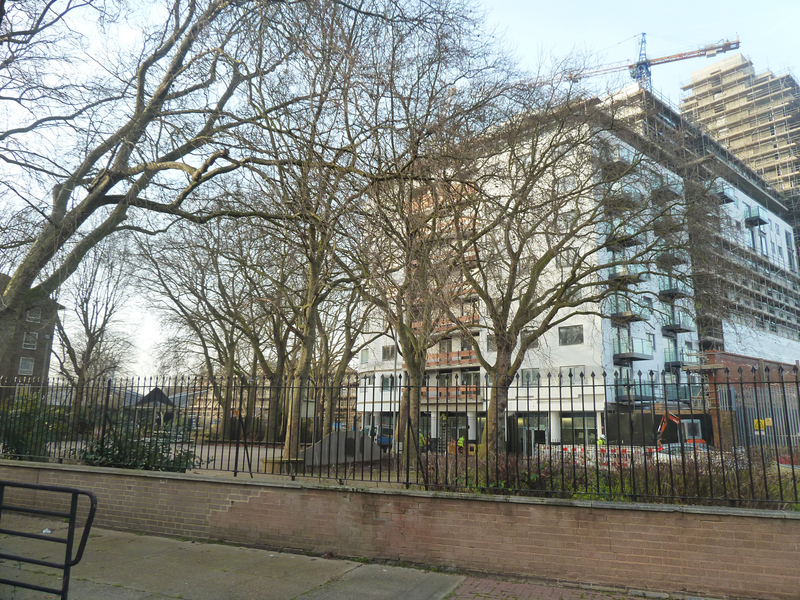 The Movement application for Norman Road SE10 was submitted to Greenwich Council in 2010. We weren't consulted even though it has a significant impact on our skyline if the cranes are anything to go by, which can be seen from the other side of Deptford. Proposed buildings are always shown in isolation, renderings rarely show the true impact, and only planners know what's going on elsewhere in the area. On these borders between Lewisham and Greenwich, you may wonder whether there is any collaboration. Historically there is very little. 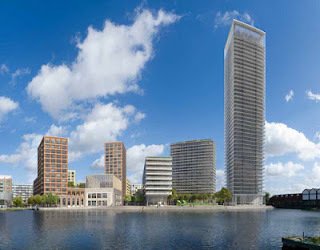 In the 2011 planning drawings (submitted to Greenwich), The Movement's new towers are set against the backdrop of Creekside Village, as if to say "our towers are quite modest and unobjectionable" compared with what's planned for the area. Click on the image below of The Movement to see a larger view of what is proposed for Creekside Village EAST that has yet to materialise. It shows a really massive tower to add to the horrendous wall of glass that is already there (Creekside Village West). 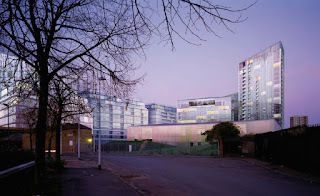 This would be on the site behind the Laban and straddles the borders of Greenwich and Lewisham. And below, the view from the bridge on Creek Road in which two of the new towers and the new wall are visible. 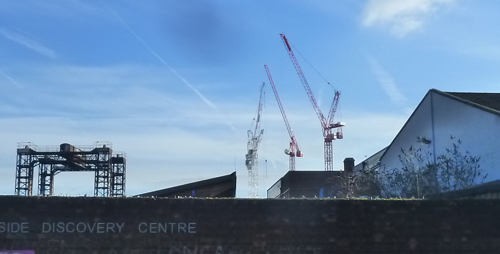 And a view from Creekside in which all four new buildings can be seen looming up behind the Laban. Very recently, planning permission has gone in again for the footbridge that would cross from the Laban (west side) to Norman Road (east), which the Deptford Dame has written about this month. Update: It is now rumoured that the Laban bridge may be the one aspect of the old application that needs to be completed before the developer (Ampurius Nu Homes) can sell off the Eastern side of the site to another investor. It is thought that the poor bridge design is unlikely to be approved, and the Creekside Village East project may be delayed still further. We hope. Closer to home, Workspace's Faircharm application uses Creekside Village West to show how modest their tower is in comparison. If the drawing was extended further east, it ought to show also the proposed Creekside Village East super-blocks and The Movement development. But it doesn't. The drawing tries to show that views are not obscured very much for anyone standing in the road and that there is no loss of light, although everyone in the flats in front of the development on Crossfields will have a radically altered view and loss of light. The developers claim they'll have a better view because they'll be looking out onto a nice development instead of an industrial estate that the developers themselves have allowed to run down. Meanwhile, the plans for Creekside Village West & East have served to make every other developer's ambitions look modest in comparison. 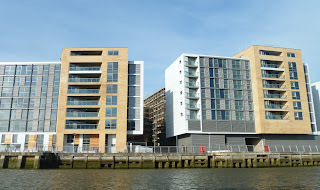 We already have the monolithic new wall separating us from the river that is Galliard Homes' Capital Quay. 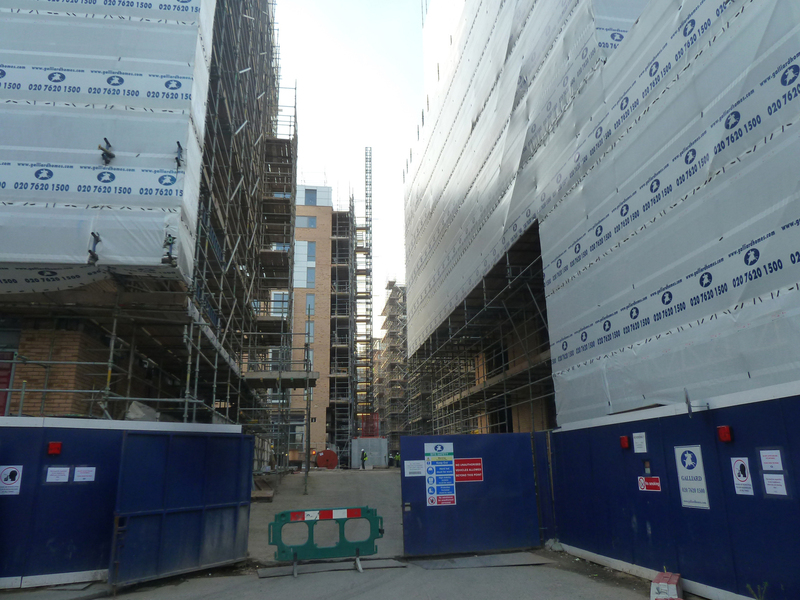 The density of this development means there will be no light at all to the apartments at its interior. Further out along the river, there's a new 40-storey tower planned for Surrey Quays (below)...and more towers at Greenwich Peninsula. Perhaps though, slimline towers (Seager Tower?) aren't quite as bad as the the 12+ storey blocks that always seem to surround them. The height, density and massing of the surrounding buildings are what cause loss of light and wind tunnels and make a development even more inhospitable and inhuman. Back in Deptford, after a long lull (developers ran out of cash, rented out site as film set), building is progressing apace at Paynes & Borthwick Wharf down by the river on Deptford's Watergate Street (Greenwich), where local residents endure work going on six days a week, stationary concrete mixing lorries queue in the street waiting to get onsite, construction workers park anywhere they like (including in front of the Dog n'Bell, preventing beer deliveries) and Twinkle Park is littered with construction workers' drinks cans and fag butts. 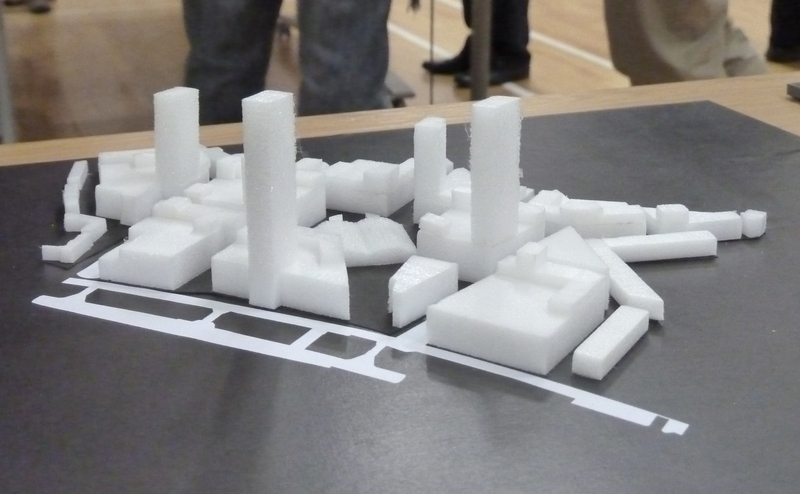 Here's a model of the development shown in isolation to its surroundings...and as it is on the street behind (with a similar block to Crossfields, Rowley House, on the left). Almost right next door is the 40-acre Convoys Wharf (aka The King's Yard). 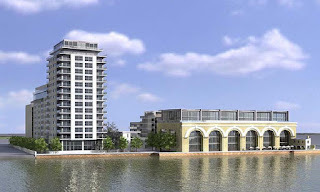 This week we shall see what Farrells have planned for the site since their first engagement with the project last year. 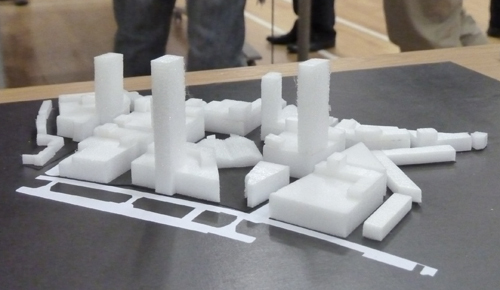 It is still likely to be 3500 flats and three very tall towers. 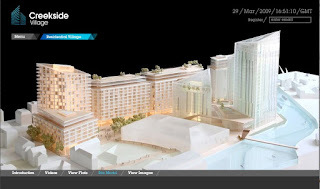 Below are two renderings by the previous architects Aedas (2011), followed by Farrell's model, shown in July 2012. Farrells lowered the heights of some of the surrounding blocks and paid lip service to the history of the site, but the density remained, as per the brief of their masters, Chinese conglomerate, Hutchison Whampoa. Like the architects before them, Farrells insists on talking about the towers at Convoys Wharf as a way of 'landmarking' Deptford as seen from the river and Canary Wharf. Obviously, tall buildings are a way of getting maximum return on a site, and to this day, News International, who sold the site to Hutchison Whampoa, still have a profit share on the luxury flats sold. 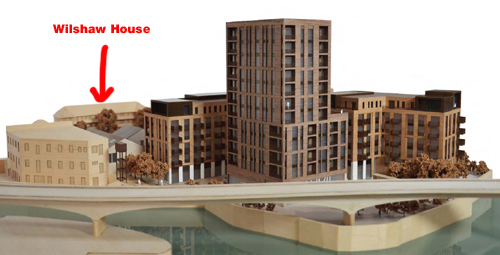 At a recent 'public' meeting Workspace also described their proposed luxury residential tower at Faircharm as a way of 'landmarking' Deptford Creek. The change from industrial use (employment) to mixed residential use will apparently fund the renovation of the much reduced business space. Residential use is required, says Workspace's Development Executive, because "Lewisham is a net exporter of employees to jobs in central London". However, not building luxury flats by this riverside, they say in their planning application, would be a "missed opportunity". The gift that keeps on giving, of course, is public access to the river (or muddy Creek). But at what price? Change in itself is not the problem. We have gained a lot from London's new relationship with its river. Tate Modern and the London Eye have both created new areas of the city, bustling with life, a healthy mixture of uses, and all the attractions that a view of water can bring. But a lot more of the new Thames is not like that. Large stretches are dominated by a continuous wall of riverside apartment blocks that have driven out everything else, to create a tidy but sterile monoculture. The river has become a thin strip of affluence, existing in a bubble that has nothing to do with life in the rest of the city just a street behind. Now developers, driven by soaring land values to extract the most out of every inch of riverside, build as close to the river as they can. Whole stretches are now lined with apartment blocks, built to take advantage of the views of the river, but the result is to offer residents spectacular views of all the other ranks of balconies on either side of them, and on the other side of the river, looking back at them. In the process the Thames has been turned into something very much like a very long thin football stadium. See also Owen Hathaway's recent article The Shard: Beacon of the left's skyline in The Guardian on 12 February 2013, a little less than ten years later than Sudjic's. Hathaway argues how the Section 106 agreement, by which local authorities are able to bargain some sort of public infrastructure out of developers, has failed spectacularly. Not helped, of course, by the relaxation in planning laws that now allows developers to duck out of any commitments to affordable housing (let alone housing that is actually affordable). For Crossfields, the immediate problem is Faircharm, where the owners wish to make the most of their land next to a very muddy Creek. Someone told them it was a river. Which it is. 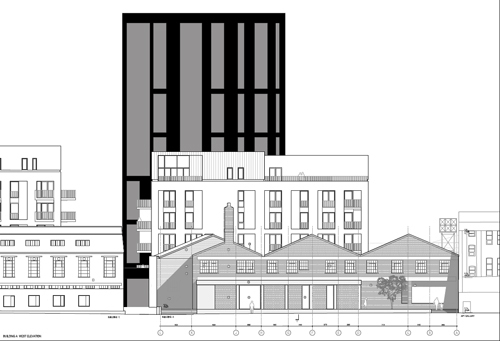 Across the way, architects BPTW who own the land across the Creek almost opposite the Laban had planned a tower. They have now modified their ideas. At the southern end of the Creek, Galliard have a hold, but Creek dwellers may be alarmed to hear the rumour that Lewisham College are reconsidering the sale of 'the island' again, a piece of concrete that straddles the Creek and which the Ravensbourne is channeled through to appear on the other side of 'Deptford Bridge' and provide a lovely setting for the Seager development. The Movement can't really be considered a riverside development. We mention it because it grows stealthily on our doorstep, and it's particularly relevant because it has displaced an industrial business site (an employment area) which had to be closed a few years ago to make way for it, in the same way Faircharm businesses will be closed down to make way for residential flats. The Movement is also in Greenwich, who don't seem to have any credible planning policy. But, although we haven't examined the respective land ownerships, it doesn't seem much different to Thurston Road, another business site which was sold off and is now being developed to join the towers of the monstrous new Croydon-like development on Loampit Vale. 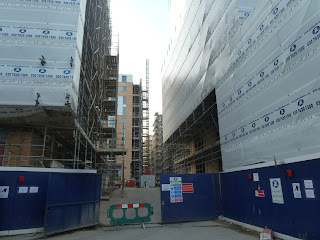 Update 6 March: see also Alternative SE4's news on the stalled Lewisham Gateway development. 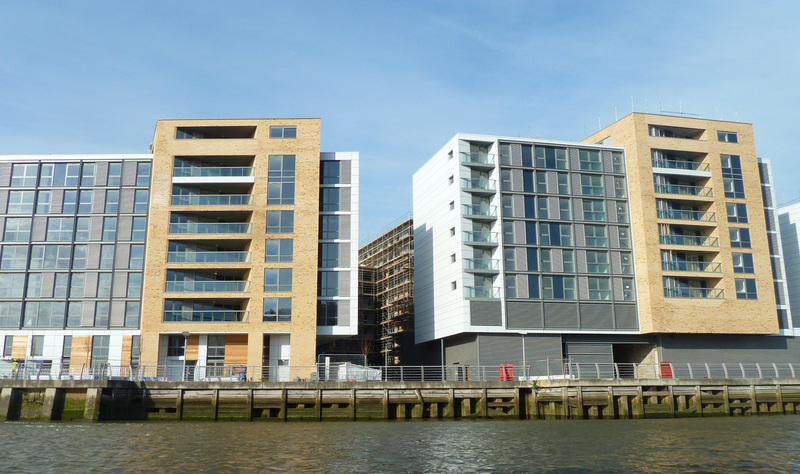 Cannon Wharf and Marine Wharf also look to put more stress on the Evelyn Street area. (See Alternative SE4). Round the corner there is the massive Surrey Canal Road development. Also see: What is the right way to regenerate in London? UPDATE 26 FEBRUARY: Act NOW to stop Section 75! Save Lewisham Hospital have now put up a page about the story below, and have very helpfully provided two letters you can email to Parliament. Last week, the government brought out a legal document that sets out the Regulations to be applied to the Health & Social Care Act (which was passed last year). Hidden away in the jargon, and easily missed by many, is Section 75 in which Clinical Commissioning Groups (CCGs) are obliged to put out to tender almost every NHS service – to any penny-scrimping profit-making bidder. The new regulations grant the 'regulator' (Monitor) sweeping statutory powers to intervene and enforce competition. Monitor will be able to decide when CCGs have breached competition regulations, and have the authority to stop arrangements that they deem flawed and to impose competitive tendering and the offer of 'Any Qualified Provider' (step in, Virgin etc). As Polly Toynbee writes in The Guardian today, "At first patients may not notice who profits from their services, as private companies hide under the NHS logo. But the change will be irreversible when NHS services atrophy once contracts are let out." Much of the tax you pay towards the NHS will go into the coffers of private company share holders, and we'll be bailing them out like the banks. The government have lied and misled everyone, and this secondary legislation is the final nail in the coffin for the NHS. BBC News at Ten finally reports NHS privatisation with government bias, and story hidden away again on Health pages of website www.bbc.co.uk/news/health-21649307. On BBC Radio 4's Inside Health, Lord Howe promises a re-write of NHS regulations "within a few days". Boris Johnson will be at Broadway Theatre, Catford on Thursday 7th March (6pm for 7pm–9pm), for People's Question Time, which is organised twice yearly by the Mayor and London Assembly. You can apply for FREE tickets (maximum of two). Read more on the Save Lewisham Hospital website, or apply directly for tickets here. FILM NIGHT and discussion on the fight to Save Lewisham A&E – 4th March A screening of "Running Out of Patients", a documentary on the 1987 Victoria Nurses' Strike, followed by discussion on how ideas raised in the film (direct action) might be employed to save the NHS. If you, your children, your sister of brother, your boyfriend or anyone you know was born in Lewisham Hospital – or if you just want to show your support – come along and join hands around the hospital. Update 25 Feb: Lewisham Council legal action decision delayed...see News Shopper story. Direct Action...targeting the companies which profit from extortionate debts put on our NHS, including the South London Healthcare Trust. Local assemblies are open meetings where local people can decide how to impove their area. Anyone who lives, works or studies in each ward can attend (our ward is New Cross). See this Council web page. Refreshments will be available. For more details see here or contact Brigid Howarth, New Cross Assembly co-ordinator on 020 8314 8038 or email. Last Fridays is an opportunity for arty types to meet up and preview what's going on in galleries and spaces in Deptford, Bankside, Peckham and Bermondsey. It's organised by South London Art Map (SLAM). This Friday SLAM have planned a 'Pay What You Can' tour of Peckham 'art hot spots' which starts at Camberwell College of Arts in Peckham Road at 6.20pm. See here and the Facebook page. But if you're hanging out in Deptford, between 6pm and 8pm (9pm in some cases) you can visit Bearspace in Deptford High Street, APT Gallery in Creekside, Number 82 on Tanners Hill, and Enclave in Resolution Way, off Deptford High Street. A little further afield are ASC Studios in New Cross and CueB in Brockley Road, plus a special event at the Stephen Lawrence Gallery in the Old Royal Naval College. Each area has an "After Party" – the Deptford After Party is at The Old Police Station in Amersham Vale. 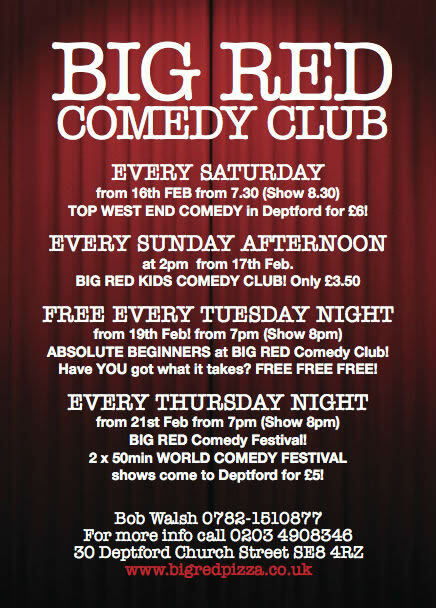 A new Comedy Club launched at The Big Red last Saturday. Click on the image above for details of days, times and prices. Meanwhile, Little Nan's Bar launched last Friday. 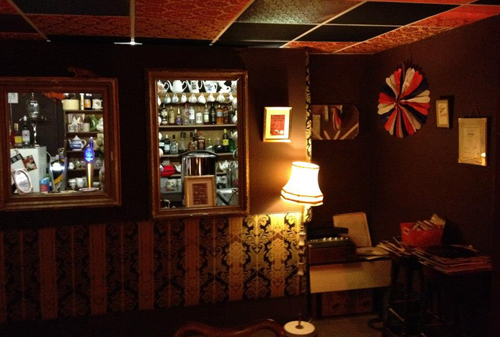 It's downstairs in the old Bunker Club at 46 Deptford Broadway and has 'popped up' to stay for six months, open every Thursday, Friday and Saturday from 5-11pm. Tiger beer for £3.40 a pint, Strongbow Cider for £2.90 a pint and loads of vintage priced cocktails and premium spirits, bottled beers, ciders, ales and wines - along with Victoria Sponge cake, Cheese straws (88 year old Recipe) and Million Dollar Shortbread. See Little Nan's Facebook page. The campaign believes that they have still not answered our questions or our concerns. We will continue to fight this. Please remember, so far only Thames Water have decided that this is a good site. Keep up to date with the fight by joining Don't Dump on Deptford's Heart's Facebook page. Last Tuesday 12 February, around 40 locals gathered at Creekside Centre to hear more about the proposed Faircharm development (Application DC/12/82000) and ask questions directly of the applicants. The Chair, Dame Joan Ruddock, explained that the meeting was for those who'd registered objections but that others were welcome. She added that Lewisham is not required by law to facilitate such a meeting but often does when there are so many objections. Lewisham planning officers, Gemma Barnes and Chris Brodie, were in attendance in a neutral role and to take notes. Ian Dubber, Development Executive for the developer (aka 'real estate investors') Workspace plc, was accompanied by Rebekah Paczek from PR firm SnapDragon (responsible for their pitiful public consultation), and the team from architects Karakusevic Carson. The audience was made up of local residents, Faircharm tenants, representatives from Creekside Centre, APT Studios and Cockpit Arts. Much of the discussion was taken up with the plight of the present Faircharm tenants, leaving little time for Crossfields residents to express their concerns. However, there were some interesting points raised at the meeting which will hopefully inform the planner's negotiations with the applicant. • We also learned that there is more time to object, since negotiations between planners and Workspace may continue until May. • Parking spaces are not likely to be increased (so this will still be a problem for everyone). Notes made at the meeting can be read below. Planning officer Gemma Barnes' 'Local meeting notes' can be downloaded here (scroll to the bottom of the list of documents). 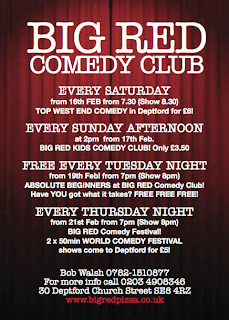 * Update 21.2.13: see the Deptford Dame's latest report on the two bridges here. See also our previous post on how to object, or sign the petition here. Ms Ruddock suggested four main themes as a basis for questions: Building Use, Phasing, Built Form and Transport, but no one really stuck to the list, so the headings below are partly notional. Despite Ms Ruddock's proposed agenda, the meeting kicked off with a discussion about Consultation (or lack of it). Why had the invitation to comment arrived over Christmas and New Year, with little time to object? 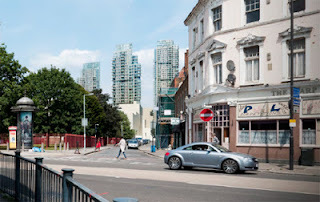 Lewisham Planners said that the Council cannot control when an application is submitted but had subsequently allowed extra time for comments/objections. In fact, the application would now not be decided until at least May (originally March) since the application is still being negotiated, and comments can be received up until that time. In a previous meeting with Faircharm tenants chaired by Joan, she had requested that a list of tenants' contact details be provided, so that they could communicate with each other. Why did this not happen? Dubber answered that they had consulted via blind copied email for data protection reasons. (So tenants were kept in the dark). When did Workspace make the decision to apply for change of use from Class B2 (general industrial) to Class B1 (light industry/office) and could they justify any demand for B1 use when so much of it was already lying empty elsewhere? The planners explained that B1 can co-exist with residential units but B2 is problematic because of noise and smell. 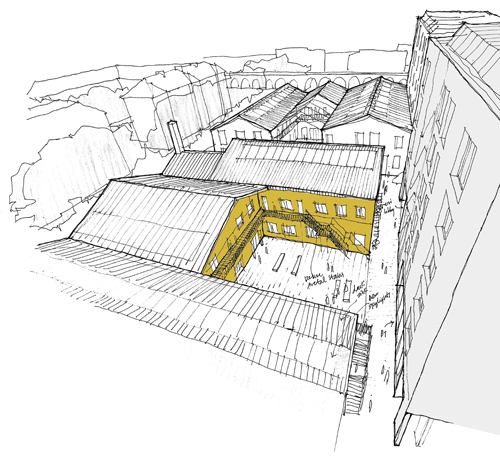 Ways can be found, however, to deal with noise and smell nuisance, and Lewisham have asked Workspace to explore whether some B2 use can be accommodated on the site – probably in the older retained buildings. However this would only be 400sqm (1300sqft), not enough to house the current B2 useage. One business present at the meeting needed 1000sqft and another 20,000. They had not been offered any help to relocate and could so far not find any alternative suitable space. Workspace did not have other such spaces in its portfolio. Ms Ruddock pointed out that Workspace are known to buy big units and redevelop them as small units. Dubber said there is a great demand for B1 use, which prompted the question why then build any residential? Workspace said the residential development is needed to pay for reinvestment in the business space. Why can't business rents pay for this? Dubber said that presently the site is 62% occupied, and the new proposals would create better and more flexible units to attract more business. A local resident commented that the high vacancy rate is because there is uncertainty about lease arrangements and tenants have left. Is it true that tenants will all soon be given notice? Dubber confirmed existing tenants have secured agreements until July, after which there would rolling monthly contracts. Dubber said they had set up a relocation fund and appointed Kalmars to look at relocation options for present occupiers. A tenant pointed out that this information had not been conveyed to them. Dubber also said they were looking at how some businesses could be retained during construction. Again, it was pointed out that this also had not been conveyed to present occupants (probably because Workspace want the site emptied). 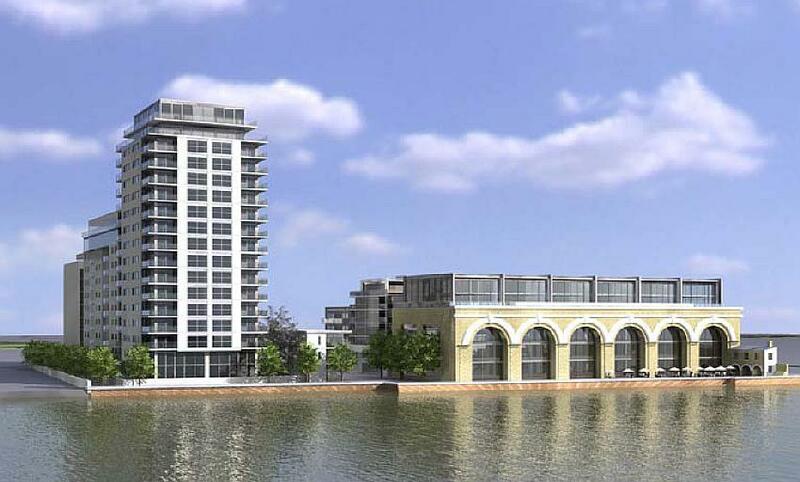 Had the architects looked at commercial development options that didn't involve residential? Dubber said they had done this exercise and decided against it. What would the rents be in the new units? The rents would go up, but service charges would come down. We don't need any more residential, what we really need is more jobs? Dubber said Lewisham is a net exporter of employees to jobs in central London. Dubber said they are currently looking at the 'phasing' options (the order and timescale in which to demolish and construct buildings). This would be submitted as additional information to the application. A resident commented that that must be tricky if they can't relocate some of the businesses. Another said they should do their utmost to work with current tenants when planning the phasing. Couldn't the Creek be used for the transportation of demolition and construction materials to mitigate the proposed road useage? Dubber said the Port of London Authority (PLA) wouldn't allow it, but the resident suggested they approach them again, since this was one of the main concerns for residents and businesses. Lewisham officers said they would encourage the use of the Creek. 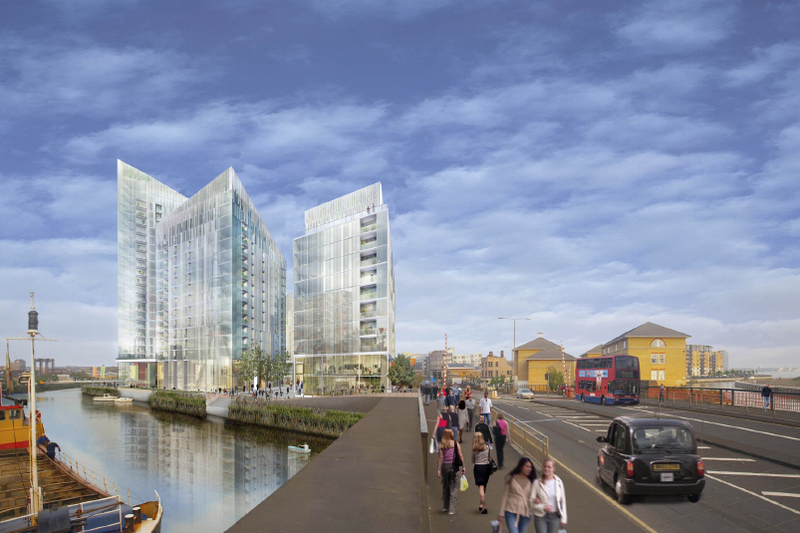 The Chair of Creekside Centre said the Centre would support such a plan, and as CEO of Thames Gateway Partnership she would speak with the PLA to discuss the idea further. Ms Ruddock asked if there were any objections to the design of the development. A resident suggested the design isn't sympathetic to the heritage assets of the Conservation Area. Dubber said design is subjective. Others felt the proposed height was inappropriate, but Dubber said there are other tall buildings in the vicinity and their tower would "landmark" the Creek. The audience laughed. In designating the area a Conservation Area, why had a decision been made that Building B (proposed to be demolished) wasn't as important as Buildings A and C (fronting onto Creekside)? The planners explained that Building B wasn't considered to be as historically significant. Could the Planning Committee request retention of Building B? The Council will indeed have to decide whether to allow Building B to be demolished, but not allowing it would mean refusing the entire application. (Workspace would then appeal). The planners are still negotiating all aspects of the proposal. How much commercial space will be provided on the site? 100,000sqft would be reduced to 57,000sqft. Is there a Section 106 to mitigate the impact of the development? The Council would be expecting a contribution to affordable housing, improvements to transport links, education provision and enhancements to the Creek etc. (No ideas have been submitted by Workspace that would directly benefit Crossfields residents, and planners later said that they can't insist on direct benefits, for instance, nursery provision within the new buildings, if they are not offered by the developer). Workspace have been looking at improvements to pedestrian routes which will form part of the Section 106 mitigation. 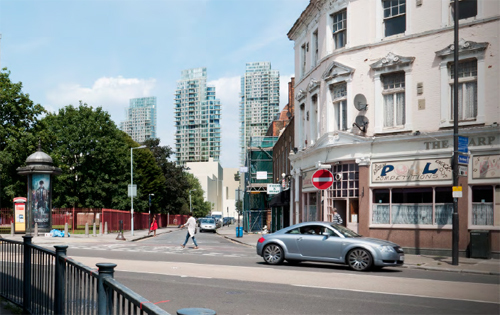 Improvements to the Ha'Penny Hatch (the route to Greenwich rather than Deptford DLR), are proposed, whilst routes to Deptford station would resurrect plans for a path through the estate, involving the demolishing of a tenant's garden. Are 28 parking spaces enough? 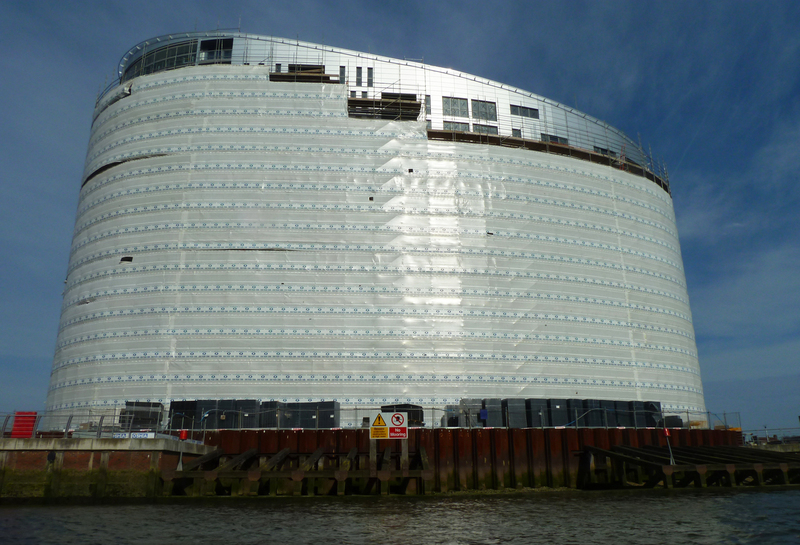 Dubber said the number was dictated by the Greater London Authority in the London Plan Standards. (Planners later said this was the maximum as it related to residential units, it could be demonstrated that more were required to accommodate commercial use, but it would depend on what other sustainable plans are put in place). How will construction affect residents? Dubber said they had submitted various reports on transport, ecology, noise, air quality etc to be assessed by Lewisham. Construction traffic would be 90 trips a day. This was corrected by a resident to the real figure – 180. Dubber said it wasn't a big deal because their reports showed there were already 290 trips to and from the site. Residents and business tenants argued that this figure was greatly exaggerated and the report must've been conducted when Creekside was being used as a rat-run which happens when one of the major routes is congested for whatever reason. Dubber suggested congestion may have been bad during the Olympics. This prompted more laughter (there was hardly any traffic during the Olympics). Others pointed out that the road is too narrow for construction traffic, and there would be health implications. After the meeting, some residents took the opportunity to view the model for the first time, and the main topic of conversation seemed to be the conduct of Workspace's Ian Dubber. One resident commented, "I thought the Workspace guy was appalling. He smirked, derided and patronised his way through the entire meeting. Even Joan Ruddock and the architects looked embarrassed by his conduct. They'd be better off appointing a better spokesperson or someone with better communication skills." 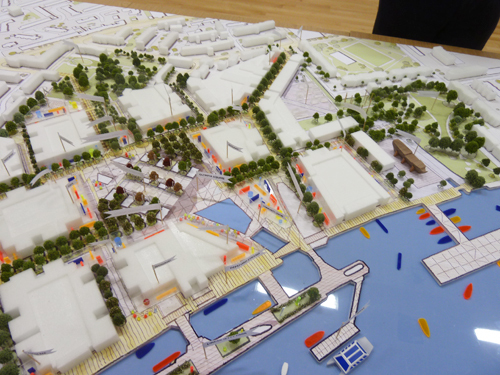 Developers Hutchison Whampoa invite you to view their latest masterplan proposals for Convoys Wharf. The exhibition takes place on two days and will reveal the work that architects Farrells have done since the last exhibition in July 2012. The photo above shows the height and massing of the masterplan as it stood in July – will it look any different? The model in July included on it home-grown community heritage projects Build The Lenox and Sayes Court Gardens, albeit in the wrong places. Will they still be included? How will the listed Olympia Shed be used? To re-familiarise yourself with the issues raised at the last exhibition, read this report on the Deptford Is... blog. Please tie a red balloon outside the railings of the hospital, take a picture, send to your local paper, Facebook it to your own page and to the Save Lewisham Hospital page. LUNCHTIME RALLY at the war memorial opposite the hospital. 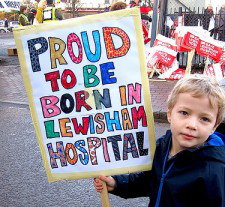 An event is being organised in which people born in – or who gave birth in – Lewisham Hospital, their friends, families, colleagues and supporters, can join hands around the hospital. More info here. Also read the latest news from Louise Irvine, Chair of Save Lewisham Hospital Campaign here. Lewisham Council has launched a legal challenge and the Save Lewisham Hospital Campaign is in discussion with solicitors to mount a separate but complementary case. Both need help with fund-raising for legal fees. In a letter to the Secretary of State, the Council is giving Jeremy Hunt until 22 February to withdraw his decision. A similar letter has been sent to Matthew Kershaw. The Council has set up a Legal Challenge Fund to enable people to help by donating to the court costs. In the event that the court awards costs in the Council's favour (or if for any other reason your donation is not used for the legal action) the Council will donate your money to local charity Children First Lewisham. You can contribute to the Hospital Legal Challenge Fund here (via debit or credit card). Local bloggers have been ticked off for publicising a meeting at Creekside Centre tomorrow night in which Workspace, the owners of Faircharm, will be grilled by local objectors (see previous post). Those who have objected to the development received a letter from Lewisham Planning inviting them to the meeting. It did not suggest the meeting wasn't open to the larger public, although recipients were requested to RSVP since space would be limited. We have been told that "there is nothing to prevent attendees at the meeting from canvassing their friends and neighbours in advance for additional questions to put to the developer". But since the invitation to the meeting only arrived last Thursday (7th February), there has been precious little time (five days) for anyone to canvas anyone else. Many invitees may be unable to attend because it is such short notice. That is why we publicised it. Residents and other businesses were sent a letter just before Christmas (17th December), asking for objections to be received by 7th January – hardly an appropriate length of time for people to respond in, or even grasp the implications of the proposed development. The developer's own 'exhibitions' (two in two years) failed to attract much interest, and showed only possibilities that might form part of their eventual application. 'Consultation' consisted of questions like "What kind of activities would you like to see during the day and in the evening at the Faircharm Creative Quarter and along the Creekside?" No reference, of course, to the downside of the development for local people. The nitty gritty of the proposals were only revealed after the application went to Planning in late December – and very few people were ever going to read through the thousands of pages in the application and uncover the unpalatable truths (much of which is hidden in lengthy appendices). Despite this, around 50 people have taken the trouble to make their opposition known to Lewisham Planning, but only 6% of Crossfields residents have recorded objections. Many residents will still be unaware that there will be noise, dust and pollution – plus 180 lorry trips per day rattling down Creekside – for three years, or that they are going to lose up to 20% of their daylight when the development is complete. View the application in brief here. UDATE 11th Feb: Please note We have now been told this meeting is only open to those who have already objected. 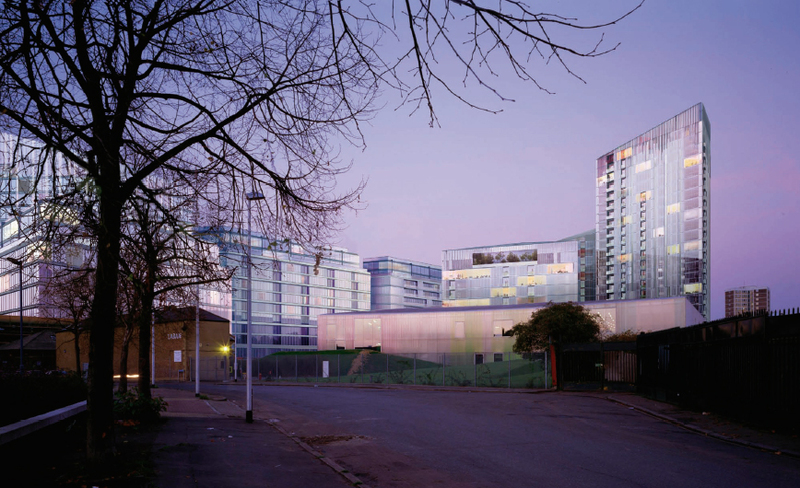 Lewisham Planning has organised an informal meeting between representatives from Workspace and local residents and businesses opposed to their plans for the redevelopment of Faircharm Trading Estate on Creekside. The meeting is to be chaired by Joan Ruddock. • 180 construction lorries per day for three years – Creekside will become dangerous, noisy – and polluting as traffic backs up a) because it's a rat-run and b) there is parking on both sides (where will people park otherwise). Dangerous for cyclists, dangerous for children, dangerous for drivers on that blind corner. • Demolition causing rats, dust and pollution, and more dust, but apparently not enough to affect your child unless s/he already has asthma. 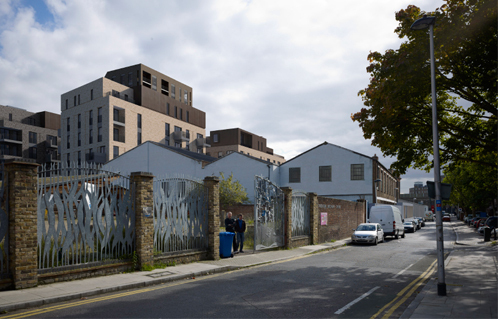 • The ejection of the very creative businesses whose reputations have contributed to the applicant's dubious name for its development: Faircharm Creative Quarter. And the only thing promised to Crossfields residents is access to the Creek. This will be an area by the Creek that will be in shadow for most of the day and evening thanks to the 12-storey tower block. Many missed – or took no notice of – the previous two presentations by the developers over the past two years. Perhaps you feel you don't have the power to stop the changes being inflicted on you. But this is your chance to say no. The Crossfields Food Growing Project is hoping to build a greenhouse out of recycled plastic bottles – and needs your help! A notice went up around the estate before Christmas, and so far around 200 bottles have been collected, but five or six times that many are required to build the greenhouse, so please keep collecting! The greenhouse will be used to grow seeds for the community garden and also for growing free plants to put in your window boxes. Please drop off used bottles to Tim at no.8 Castell House – just leave in a bag outside his front door. 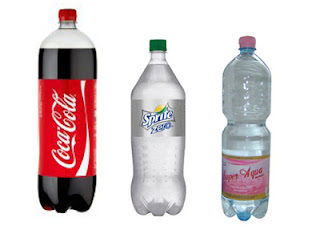 Only clear or green plastic (large or small) is required, please no opaque white bottles! 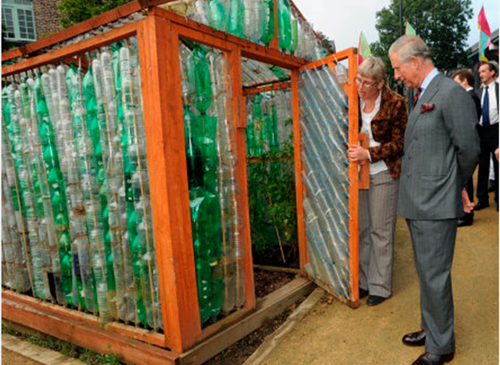 The greenhouse might look like this once completed (though Prince Charles may not visit us!). If you'd like to find out more about The Wonky Prong, or get involved, check out the Wonky Prong blog for contact details. See further statement from Save Lewisham Hospital.